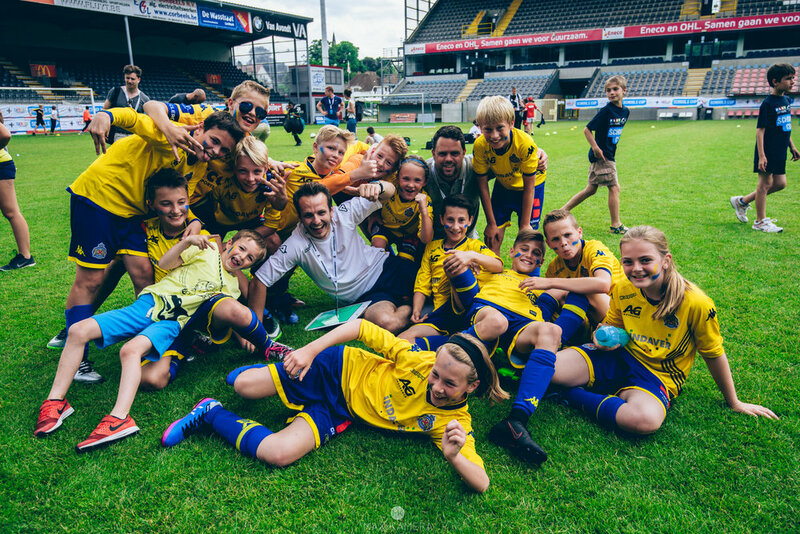 Play for Change (PFC) and Pro League have hosted their third annual ‘Schools Cup’, a youth football tournament that was held at the Eneco Stadium of Oud-Heverlee Leuven in Belgium. The tournament provided 280 children aged 11 - 12 years old with the experience of playing in a professional football stadium in their favourite team’s kit, whilst promoting values of social inclusion and fair play through football. Since 2015, PFC, the charity dedicated to improving the lives of children through sport and education, and Pro League, the top football league in Belgium, have provided this unforgettable opportunity for children across country. PFC, together with the Pro League +, the social arm of the league, enabled 20 teams to participate in the national tournament. The Schools Cup encourages social integration and inclusion through teams from all over the country, including teams from two refugee centers, coming together to play football. In addition to the sporting aspect, the Schools Cup promotes gender equality and fair play. The teams were mixed with at least three girls per team and a Fair Play cup was awarded to the team that demonstrated positive sporting efforts. The tournament provided an inclusive and safe environment where the children could enjoy playing together, regardless of their background, and benefit from the educational aspect of sport. In addition to the tournament, the participating schools delivered social impact projects earlier this year. These inspiring projects included children creating insightful anti-racism films,raising awareness of the struggles of child asylum seekers, and volunteering in soup kitchens. Kevin Buytaert, Leader OC Linkeroever Refugee Centre, said: "Playing in the Pro League and Play for Change Schools Cup is an experience that the children will always remember. The tournament has been an important project that is high on our annual planning which the children really enjoy being a part of." Stijn Van-Bever, CSR Manager Pro League, said "Football can play a crucial role in generating positive change and it is wonderful that through Schools Cup the professional clubs have been able to help develop their community, whilst promoting values of social action." Play for Change and Pro League congratulate all the teams for theirsporting behaviour during the tournament and all the fans, young and old, who positively encouraged players like real pros. Thank you to all the partners who supported the Pro League Play for Change Schools Cup. The Pro League's business framework consists primarily of the organization and planning of the main football competition: the first class or in its current form is better known as the Jupiler Pro League. In addition, the Pro League grants various forms of assistance to its members, the professional clubs. That direct support is focused on different areas; Legal, financial (distribution of television funds) and in the field of data management. Finally, the Pro League also defends the interests of the clubs with the CFP, government, and, if necessary (unisono with the CFP), to international football agencies such as UEFA and FIFA. Pro League + is the Pro League social pillar and works with the Football + Foundation on a social football story. Pro League +, together with the sixteen Pro League clubs, strives for a strong CSR policy, which is a leverage to make a positive contribution to society. Pro League + supports clubs to strengthen their CSR, or community action. In addition, Pro League + organizes two stage events each year, where we provide forums with forums through our channels, the Pro League + is committed to supporting organizations recognized by emergency organizations and organizing the Christmas event annually, with all clubs / associations and fans working together to Collecting funds for a social organization.